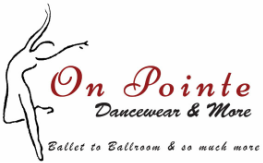 On Pointe Dancewear opened in October 2007. The store has grown ever since, and our success is all because of you and your continuing support of our store - thank you - we know of thousands of happy customers. We strive to fill the dancewear needs of all our customers. You are important to us, and we want you to have the best footwear and dancewear for your dancing, whether it is ballet, jazz, tap or any type of ballroom dancing. The store is owned by On Pointe, LLC, a Florida Limited Liability Corporation. The Managing Members of On Pointe, LLC have been involved in the dance world since their daughter was 3 years old. They opened up this store with the hopes to help all parents have a one-stop shop for their children's dancing needs. They always had the parents in mind when they made any decision about the store, because they remember what it was like to have a young dancer in the house and how hectic life can get.